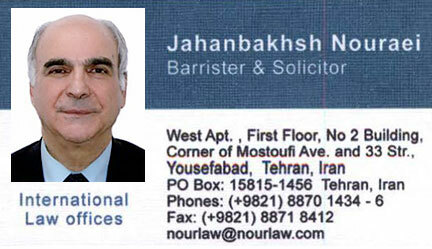 I, Mr. Jahanbaksh Nouraei am the president of Nouraei & Mostafavi Law Offices founded in 1993 in Tehran. We render legal consultation and other services primarily in the area of corporate law to domestic and foreign companies and businesspersons. My self and Mr. Majid Mostafavi Kashani are the principal partners. Both of us hold first grade licenses from the Tehran Bar Association authorizing us to practice as both legal advisors and defense attorneys throughout Iran. This authorization is reflected on the main page of our website, www.nourlaw.com which shows the wide range of our services in different fields of law. We are also linked to several associate lawyers experienced in specific areas of law and legal practice. Their expertise is used on a case by case basis. In addition to the professional details listed above, for 10 years I was founder and Director of the Legal Department and Arbitration Center of the Iran Chamber of Commerce, Industries, Mines and Agriculture (ICCIMA), plus a number of trade and industry associations, as well as being the legal counsel to a number of Tehran-based embassies. I am also the head of the legal commission of the Hamedan Chamber of Commerce, Industries, Mines and Agriculture (HCCIMA). As for foreign clients, most of the services are rendered by our affiliate entity Arman Iranian Legal and Economic Institute. The above positions and the experience / links generated therefrom, have put our law offices in a unique position with respect to providing first-rate and timely legal and commercial advice and services to our foreign clients, thereby enhancing their investments and assisting in resolving their export and import problems with respect to Iran.